The Museum of Modern Art put on a show this summer of Jenny Saville‘s new works. Some larger drawings supported by a good choice of well-known large canvases. The gallery was large with pictures given loads of space and light. The most recent drawings were in the first room with larger well-known paintings upstairs. In the basement they showed a short documentary where JS was interviewed. She spoke clearly about her work, ideas and reasoning without much jargon or many buzzwords. In the interview she tried to separate herself from the postmodern movement, but I’d say she could be linked to it with those drawings. She played with layering in drawings by either over-drawing older and slightly faded charcoal work, or by drawing onto tracing paper and laying it on top of another drawing. It’s almost like layering in graphics software like Photoshop. Suchtechniques did mimic the depth seen in the large paintings upstairs. JS’s work must be great for art critics. There is so much to talk about; technique, the name-dropping references game, feminism, cosmetic surgery all linked to its place in contemporary art. Maybe I shouldn’t spend too many words doing all that and get to the main point of my post. What struck me most about this? It was the eyes. Such large and energetic pictures do fall apart on close viewing. In my opinion, most pictures have an optimum viewing distance. Some pictures should be viewed close while others you should step in closer. These large canvases demand a rather more ambiguous range. If you get in close, those sculptural forms do fragment into blocks of rapidly swept oil paint. There remains the eyes however. No matter how much you lean in and fill your panoramic view with the canvas, the eyes remain as vivid as a photograph. Even better than that, they’re as vivid as real life. I do think that a portrait must have a life of its own, something that we can relate to. For me, eyes are usually a route into the personality of the picture. So stand close, close enough for the catch-lights to reveal the room that the sitter saw while posing. Do this and most of the picture breaks into flesh coloured crazy-paving, but despite all of that shrapnel, there remains life in those eyes. I won’t deny that these are disturbing pictures, but I mention this point second because the life and warmth of the pictures are primary. A first impression might be of car crash victims, but these characters don’t seem so traumatised by their injuries. If they are the results of cosmetic surgery, they will have paid money for the cuts, the blood and bruising. They will endure with optimism, do they hope for a happier future with a new cosmetic façade We could talk now about cosmetic surgery as a step on from make-up. I won’t because I am not really qualified to hold an opinion, it’s not really my field. Anyway, we had a very nice day in Oxford and even went punting. Later I dried out in a nice wholesome cafe and watched the the cyclists wheel by, often on their single-speed fixies. Decent coffee too. 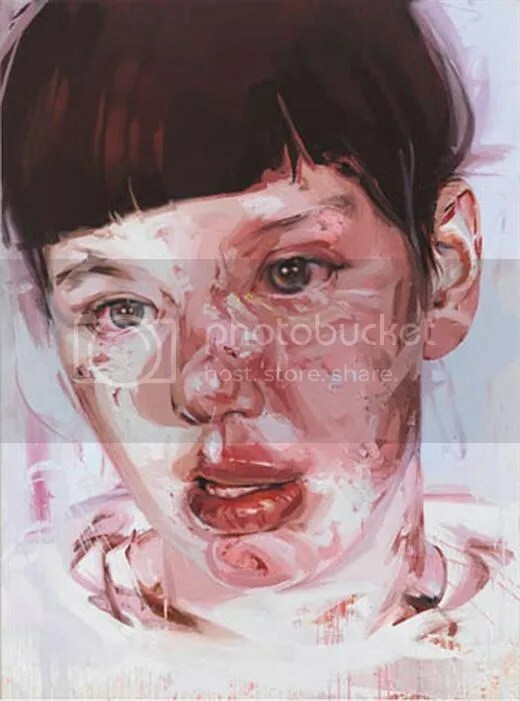 This entry was posted in Art and tagged art, Galleries, Jenny Saville, Modern Art Oxford, MoMA, Museum of Modern Art, Oil on canvas, Oxford, Plastic surgery. Bookmark the permalink.